New Bicycle Service - Go anywhere. Bring anything. You might not know that when new bicycles arrive from a manufacturer they usually require a substantial amount of preparation, assembly, and adjustment before riding for the first time. More than just properly putting the wheels, handlebars, and pedals onto the bike, the components need professional inspection and adjustment before the bicycle is safe and roadworthy. 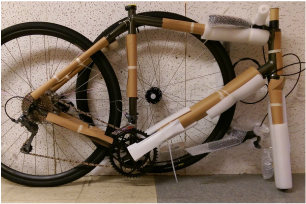 A properly assembled bicycle can last years longer than one poorly assembled, not to mention the performance advantages of a bike tuned optimally. Components last longer, the bicycle is more enjoyable to ride, and you save money in the long run. Green Machine Cycles is happy to assemble your new bike purchased elsewhere, either online or from another source. The charge varies by the type of bike and extent of work required, but usually ranges from $60 to $150 dollars. We guarantee our work with the same 30-day promise as our other repairs. If our workmanship was faulty in any way, we will fix the issue without charge.